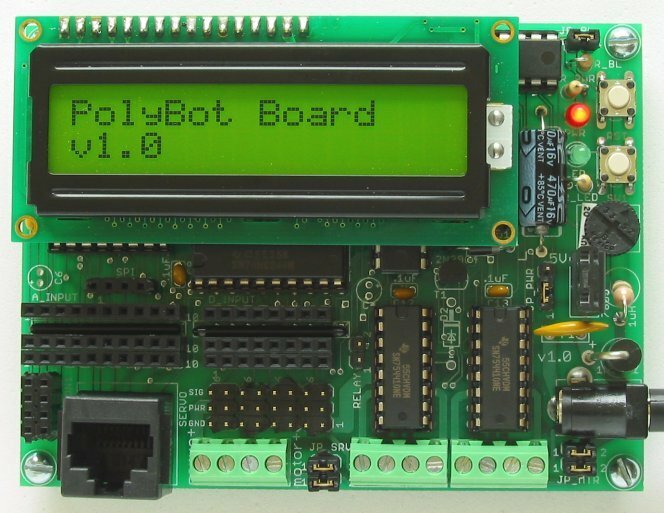 The PolyBot board is a robot controller board for use in Roborodentia, senior projects, and any project requiring microcontroller control. The kit will come with the following parts: printed circuit board, components, LCD display, download board circuit board, USB download cable, and ethernet cable. Where can I download the compiler/downloader for my computer? What's the difference between the 1.0 and 1.1 revisions of the board? 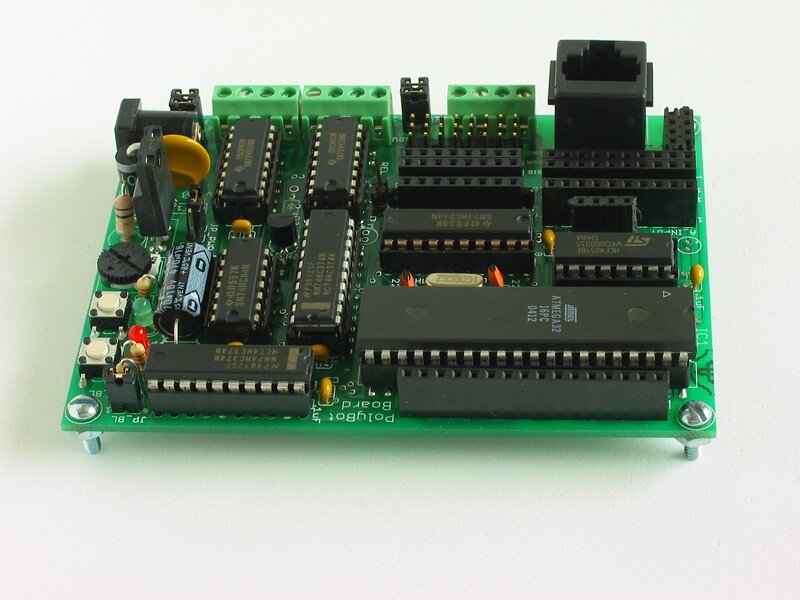 The 1.1 board runs at 20MHz and comes with an ATMega644 (newer boards come with an ATMega644P). The 1.1 revision has the I2C pins (SDA and SDL) routed out to the CON1 connector. Make sure you use the appropriate software library for your board revision. I erased the USB bootloader from my board, how can I get it back? How can I get more digital inputs/outputs? If your application requires more digital outputs than are available on the board, you can use the CD4094 (8-bit shift register with latch). This chip has 3 inputs and provides 8 digital outputs. These chips can be daisy chained to provide as many digital outputs as needed. 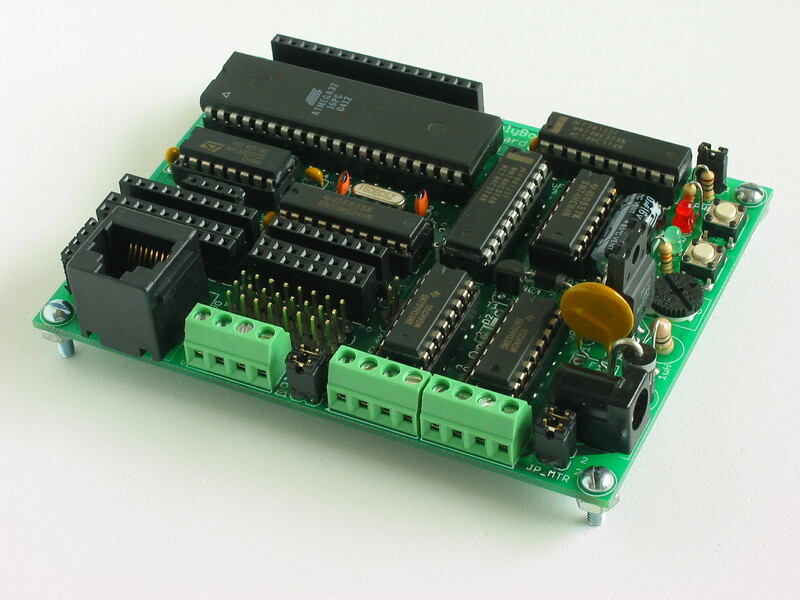 If you need both digital inputs and outputs, you can add an I/O port expansion chip like the MAX7301 or PCF8574. How can I get more program space, RAM, EEPROM, or another UART? The ATMega644 is a drop-in replacement for the ATMega32. 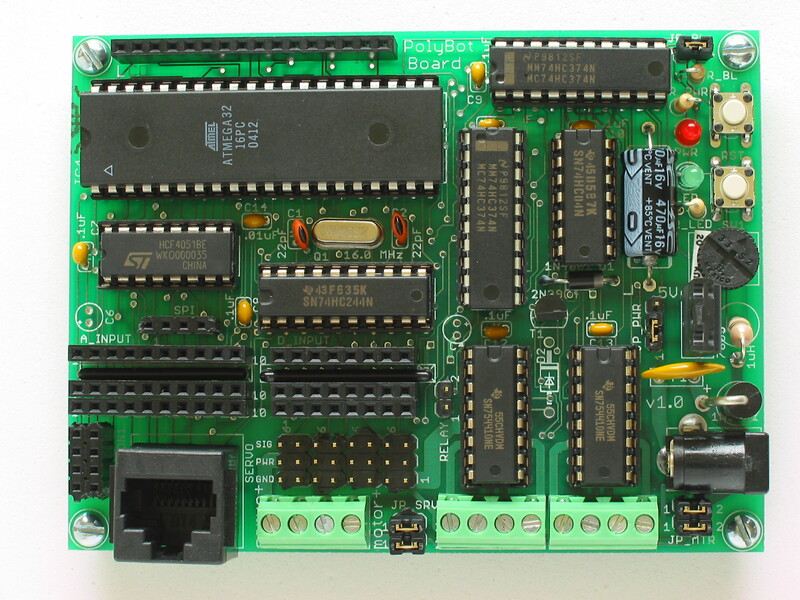 It provides 64KB flash, 4KB RAM, and 2KB EEPROM. It also runs at 20 MHz. 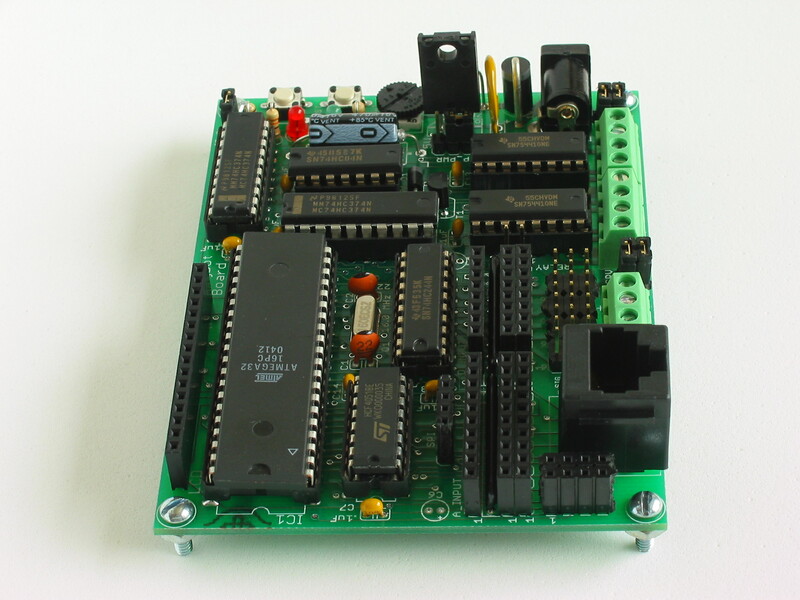 The ATMega644P has the same features as the ATMega644 and has 2 UARTs. Why are C4, C6, and D2 left vacant on the board? Extra capacitors can be placed in C4 and C6 if you find that they are necessary for your application. A Zener diode can be placed in D2 to provide minor protection against accidentally sending high voltage to the logic. Complete assembly instructions are in the user's guide. If you have never soldered parts to a printed circuit board before, it really helps to get some practice. 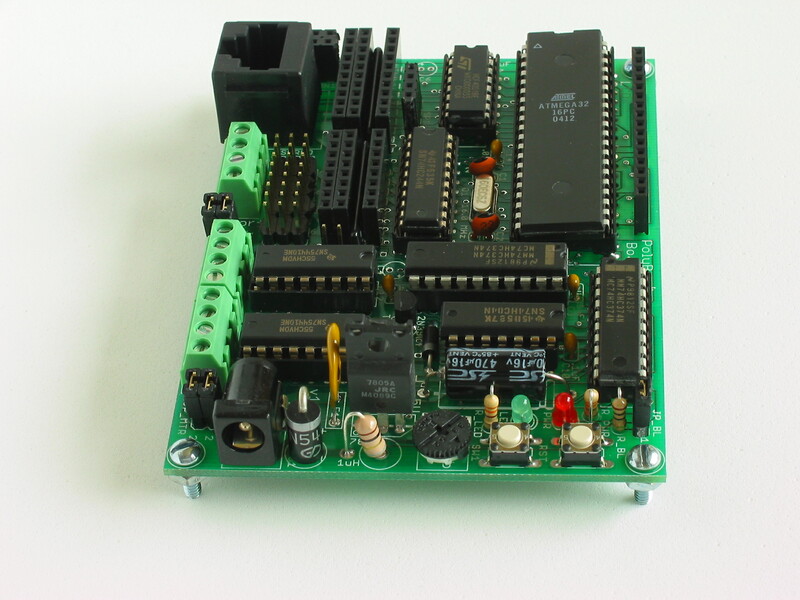 You can practice by adding solder to components on an old circuit board or by soldering components to a proto board. The key to getting a good solder joint is to heat up both the solder pad on the board and the lead of the component you are soldering. Take your time and be careful! Desoldering a socket or multi-pin connector is quite difficult, so make sure you do things right the first time. I like to solder 1 or 2 pins of a socket first and then flip the board over to verify the part is correctly installed. Then I solder the rest of the pins.